There are numerous definitions of successful aging. Rowe and Kahn (1987, 1997) defined it as including three main components: low probability of disease and disease-related disability, high cognitive and physical functional capacity, and active engagement with life. This definition was taken as a starting point in a study among 403 independently living elderly men. Since low muscle strength and functional ability were highly predictive of four-year mortality in this population, muscle strength and functional ability might be considered as the key characteristics of the physical functional status of independently living elderly men. Growth hormone and testosterone seem to play a role in the physical decline that occurs during aging. In addition, both serum IGF-I and testosterone concentrations are related to the presence of atherosclerosis. However, serum concentrations of both hormones are not predictive of death. 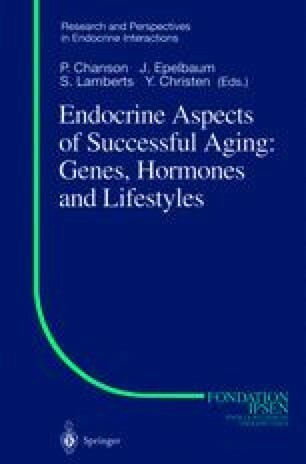 Further, the effect of growth hormone and testosterone replacement on quality of life has hardly been examined in the elderly population. Aging can be approached in two different ways: one can direct attention to the ensuing deficits or to the factors that play a protective role in the decline in function. These different approaches, which are reflected in the concepts of “frailty” and “successful aging;” need to be explained. Frailty is defined as a syndrome of multi-system reduction in physiological capacity as a result of which an older person’s function may be severely compromised by minor environmental challenges, giving rise to the condition “unstable disability” (Campbell and Buchner 1997). The variable presence of co-morbidity makes research findings more difficult to generalize. Therefore, the alternative of focussing research on the least frail and “non-diseased;” which implies the successfully aged, might be easier. Older persons with minimal physiologic loss, or none at all, when compared to the average of their younger counterparts, can be regarded as having aged more broadly successful in physiologic terms (Rowe and Kahn 1987). The concept of frailty focuses mainly on the physical aspects of aging, whereas the concept of successful aging includes a broader range of aspects, such as physical, psychological and social aspects. Neither concept is easy to define in a single measure, and there are no generally accepted criteria to categorize a certain individual. Although definitions of successful aging in gerontology are numerous, there is still no consensus on the definition of successful aging. Rowe and Kahn (1997) defined it as including three main components: low probability of disease and disease-related disability, high cognitive and physical functional capacity, and active engagement with life (Fig. 1). A definition proposed by Day et al. (2002) focused on psychological well-being, capacity for self care and social support. Fries (1988) defined successful aging as optimizing life expectancy while simultaneously minimizing physical, psychological and social morbidity. Vaillant and Vaillant (1990) argued that, in addition to physical health, there are three further dimensions, or outcomes, of successful aging: mental health, psychosocial efficiency and life satisfaction. In our study population we focused on the least frail, which implies the successfully aged. To decrease the number of subjects with severe diseases to a minimum, we invited subjects who lived independently, had no severe mobility problems and did not have signs or symptoms of dementia. Finally, 403 men, aged between 73 and 94 years, participated in this study.